The Lake San Marcos Democratic Club was excited and proud to feature San Diego City Council President Todd Gloria as our keynote speaker at the August monthly meeting. Gloria was elected to the City Council in 2008, was re-elected in 2012 and chosen as President of the Council. He felt that the city government wasn’t working, a situation exacerbated by Mayor Filner, who presented great challenges. Soon after learning he was next in line he found himself taking over for Filner. When he started to investigate what needed to be done to bring the City back together, Gloria found that he had no staff since Filner had let most everyone go and positions had not been filled. There were way too many vacancies so Todd recruited quality people to fill them. These people remain in place today under the new Republican Mayor. Gloria described his many achievements during that interim six months which included passage of a much needed $120 million infrastructure bill, a minimum wage bill, a climate action plan for the city, and a plan for the convention center expansion. Gloria spent months creating a minimum wage bill that the Council unanimously passed, only to have it vetoed by the new Mayor. While the Mayor agreed there needed to be a wage increase, he wasn’t willing to make it a living wage. A study found that for a person to live above the poverty line in San Diego, they need to earn $13.09 per hour. The mayor was only willing to compromise at $11.50/hour. Gloria hopes the Council will override the Mayor’s veto and stipulate that it cannot be altered unless a referendum is placed on the ballot and San Diego city voters vote it down. Gloria explained that he is very engaged on climate change and very aware of the drought and water shortage. His plan for the city calls for more investment in public transit and requiring all new buildings built to be energy efficient. He supports more bicycles and pedestrian transportation and renewable energy to reduce our carbon footprint. He doesn’t want to wait for the U.S. Congress and believes in the adage, “Think globally, act locally.” He crafted a plan to address global warming and it is now on the Mayor’s desk who promises to make a decision about it by September. He hopes it will remain intact. He recently wrote a commentary defending the plan that appeared in the UT. Gloria prides himself on thinking outside the box. While he’s a Democrat, he gladly works with Republicans who base decisions on what’s best for San Diegans. One example demonstrating his innovative approach was a plan for improving the plight of the homeless. Currently there are close to 11,000 homeless people on the streets. He feels what has been tried in the past isn’t working because the homeless numbers in need haven’t been reduced and fresh ideas need to be invented. He identified one problem and solved it: people who are homeless carry their belongings on their backs or in a shopping cart. This creates unsightliness in neighborhoods and prevents them from leaving their “stuff” for any job interviews, etc., for fear of losing their things. They took an abandoned warehouse and put hundreds of large garbage cans inside to serve as lockers for homeless people’s belongings. It was inexpensive to create, is working and the homeless can come and go anytime to utilize their things. If a shopping cart is left unattended for more than 3 hours, a person can replace it and the city will pick the items up and take them to the warehouse, leaving a note where the homeless person can come to claim them. He also expressed concern for unaccompanied minor children crossing over the border. He met with the head of the Border Patrol and offered locations in San Diego to help because he said, “We need to act with humanity. 8 year olds don’t leave their existing country because their circumstances are great.” He explained that stupid questions about the health problems these children might pose simply distracts from the bigger issues of safety and what laws are needed to ease repatriation. He was told there is no current need for more locations as there’s been a reduction in the flow of children coming. 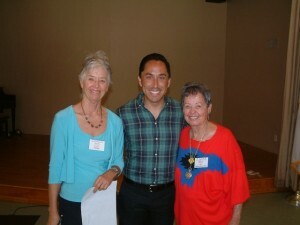 Mary Borevitz and Betty Ball with Todd Gloria after he addressed the Club at the August, 2014 meeting.